Home / Latest / Will the Real Bagel Please Roll Over? One of my fondest childhood memories is going with my father and siblings to Kramer’s Bakery in Trenton, NJ on a Saturday night after sundown, when they baked only one product: bagels. And they made only plain or egg bagels. No sesame seeds, poppy seeds or onions found their way on top of a Kramer bagel. Of course, there were no blueberry, jalapeño, or chocolate chip designer bagels available then. Instead, once each week, these round, crusty delights, without additions or corrections, came warm from their ovens for Sunday morning Jewish breakfasts. Biting into that Saturday night bagel—warm, with that yeasty taste, its crunchy outside and soft inside, like a sabra–was a weekly treat. By the time we arrived home from the bakery, my four siblings and I had usually eaten at least half the bag of bagels. But that didn’t spoil our appetites for Sunday mornings, the next-best bagel bonanza. My mother would make a meal of scrambled eggs, cream cheese or butter to “shmear” on our bagels, and lox, onions, tomato and lettuce to create a bagel sandwich. This meal transformed my “plain” bagel into a gourmet delight. The question for me is: Is a bagel still a bagel if it is stuffed with blueberries and has an eerie blue color? Is it still a bagel when spinach and feta cheese have been kneaded into its delicate, doughy center? How can I smear cream cheese on a salsa bagel? Should I spread guacamole instead? Bagels have been around a long time, and for most of that time, they were made with only a few ingredients–water, yeast, flour and salt, and eggs for egg bagels. Then, of course, there are the traditional toppings: sesame seeds, poppy seeds, onions and salt. Some traditional bagels also come in rye, rye mixed with wheat, and pumpernickel, my favorite. Call me old-fashioned or out-of-step, but I still like my bagels the original way, whether regular flour, or rye or pumpernickel with some poppy seeds sprinkled on top. If I want raisins and cinnamon in my bagels, I’ll buy a babka. If I want blueberries, I’ll eat a blueberry muffin. If I want jalapeños, I’ll order salsa with tortilla chips at the local Mexican restaurant. If I want feta and spinach, I’ll buy spanikopita at the Greek bakery. Much as I enjoy fusion cooking, when it comes to my bagel, my resolve is as firm as its crust. While bagels can be found in almost every bakery or café in America, a bagel with all the extras embedded into its lovely, round form doesn’t spell or smell bagel to me. I suspect it doesn’t spell bagels to a lot of people. Just to test my secret theory that designer bagels are not all that popular, I did an informal survey of several bagel places on the East Coast. Every one of the owners said that plain bagels are still their best sellers. I rest my case! 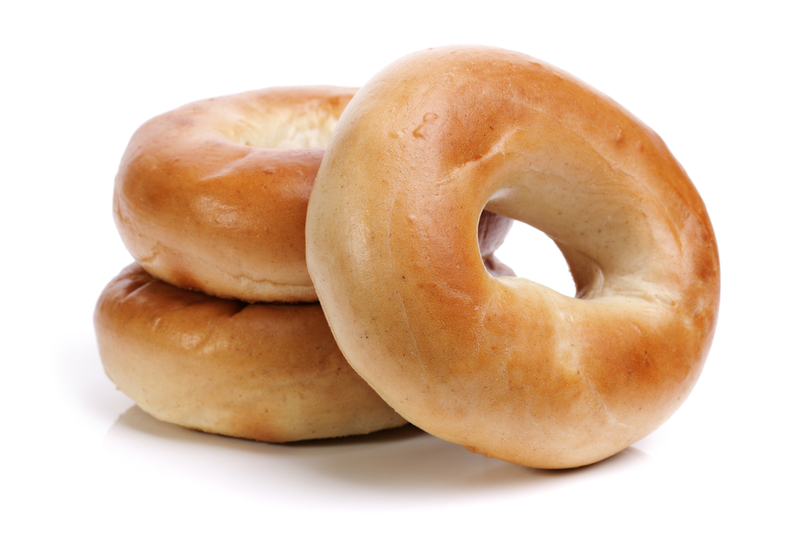 Maybe the plain bagel owes its popularity to the fact that it is fat free, can be eaten on the run, and doesn’t crumble like muffins or fall apart like tortillas. Ellen Sue Spicer-Jacobson, freelance writer and author in the field of food & health, posts weekly on her website www.menupause.info. Here is my take on this. As long as the “original way” bagels are not removed from Bagel shops in place of the foreign kinds, why should I care? If bagel makers continue to come up with the odd varieties, somebody must be enjoying them. Let it be! And what about another newcomer , the “flagel'” for those of us who like to pull out the middle of the super sized bagels of today? My daughter says, if you pull the middle out of the bagel, why don’t you just eat bread? This article was a lot of fun to read – I could almost smell the yeast! Back in Da Bronx in the forties, a bagel was a bagel. If you wanted something with salt on it you got a salt stick. Didn’t run into rye/pumpernickel bagel until we moved up to Westchester in the fifties. I still like my bagel plain. I’m all for balance, variety, and moderation. If it takes a bagel to get someone to eat blueberries that works for me. If traditional grains make you happy, cast your vote with your choices. I’m a multigrain girl with hummus and sliced tomatoes. I love your sense of humor, writing style, and your willingness to speak your truth! Your memories are treasures and I thank you for sharing them. I have a bunch of bagel favorites and am glad they all exist, and more. It’s glorious to have choices in life!